Relocating to a new city for a temporary job? Travelling abroad for vacation? Trying to finish off one semester in a different land? Whatever your reason may be for wanting to get into a furnished rental is you should know where to start your search. Furnished apartments are convenient for renters, and because of this, owners are frequently filling them. Property managers make reservations for rooms for regularly because there is a demand. Furnished housing can come in different sizes from studio, 1 or more bedrooms, to complete condos or whole houses. Studio sized apartments are perfect for a single person. They are usually tiny, and have the bed exposed; the only thing that’s private is the bathroom. Couples or families may prefer a furnished condo or a furnished house. Renting out the right place isn’t as hard as it may seem, here are 3 Steps to Finding Short-Term Furnished Apartments in Toronto. 1. If you are employed with a large company, ask if they have any kind of Corporate Housing accommodations. These are usually apartments, condos or houses that are fully furnished and can provide a place for you to stay for extended periods of time. Normally, they would include everything you need, from kitchenware to towels. 2. Look online. Craigslist.org usually has lots of local listings with opportunities to rent a fully or partially furnished apartment, condo or home. Some keywords to search would be “furnished apartments,” “short term,” or even “housing.” People might put their homes up for rent and allow for month to month lessees. Whatever you decide to do put safety first. Make sure you feel comfortable with your decisions, and have everything documented. 3. For the ultimate furnished apartment experience, contact SkyViewSuites. Their staff is dedicated to helping anyone find a perfect fully furnished place to stay. 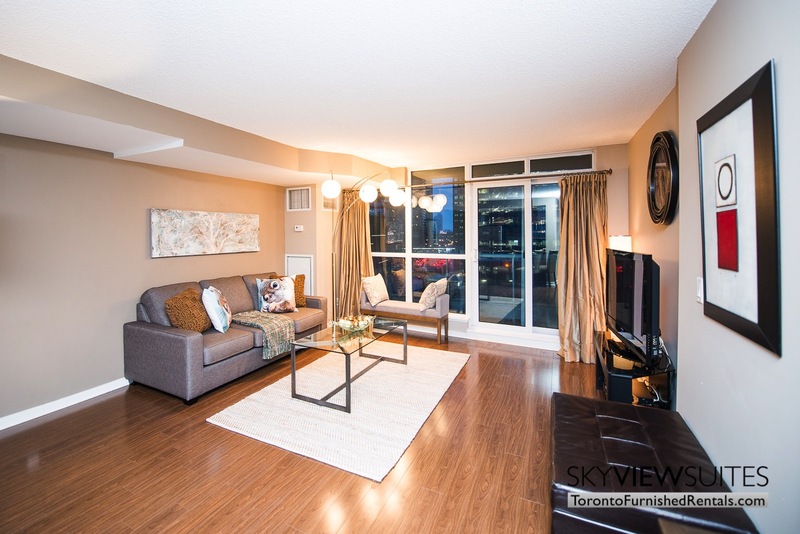 They have a wide selection of condos across Toronto and are very accommodating. Some of the buildings allow pets. Their units are elegant and affordable. So, here you have 3 steps that will assist you in finding short-term furnished housing. Remember to do your homework and search for the best thing that suits your needs. Make sure you have everything in writing, and ask as many questions as you must to find out exactly what’s included. You’ll want to be certain of all of the requirements, fees and other costs associated with renting out a furnished apartment.